In this exclusive audio interview Emmy Winner Charlotte Robinson host of OUTTAKE VOICES™ talks with Australian producer Sue Maslin about her new feature film “The Dressmaker” directed by Jocelyn Moorhouse and stars Kate Winslet, Liam Hemsworth, Hugo Weaving, Sarah Snook, Judy Davis and Caroline Goodall. “The Dressmaker” set in the 1950’s is about a glamorous worldly dressmaker who returns to her small Australian hometown to seek the truth behind the scandal that banished her as a young woman. This dark and quirky comedy stars Oscar winner Kate Winslet as Tilly Dunnage who cares for her eccentric mother played by Judy Davis and schemes with the local cross dressing sergeant (Hugo Weaving) who becomes something of a buffer between Tilly and the town’s people who haven’t forgotten the tragedy they believe Tilly caused as a child that tore the town apart and led to her exile. As she starts to unravel her scandalous past, she transforms the town’s women with her exquisite creations. Armed with only her sewing machine and haute couture style Tilly shows she is a force to be reckoned with and that revenge never goes out of style. “The Dressmaker” opens in theaters September 23rd. We talked to Sue about her inspiration for producing this film and her spin on our LGBT issues. When asked what her personal commitment is to LGBT civil rights and what she would like to see happen for LGBT equality in her native country of Australia Maslin stated, “Well, I’m gay and I love seeing movies where you have kind of complex interesting female and male characters that are not just stereotypes. They’re that kind of movies that I like and the great thing about “The Dressmaker” is that it plays on a camp sensibility. So we have the gorgeous Hugo Weaving who plays Sergeant Farrat and he knows how to handle those fabrics and he does it with such humor as well. So I guess that sensibility of subversion comes from my perspective I guess of being a lesbian and engaging in popular culture. You like to put a twist in it when you get an opportunity. 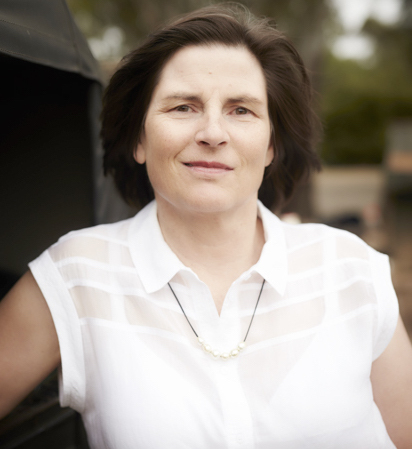 Sue Maslin is one of Australia's leading screen producers. She has a 35-year track record of producing award-winning feature and documentary films. She was the inaugural recipient of the Jill Robb Award for Outstanding Leadership, Achievement and Service to the Victorian Screen Industry and is currently Adjunct Professor of the School of Media & Communication, RMIT University; Patron of Women in Film and Television Victoria; and President of the Natalie Miller Fellowship, an organization dedicated to increasing women's participation in creative and business leadership of the Australian screen industry. “The Dressmaker” opens nationwide September 23rd. Love Sue's excitement about making this film and I LOVE the trailer....can't wait to see it.